Africa has long boasted a vibrant arts scene, with the western and southern parts of the continent getting most of the attention. But that appears to be changing, as East African artists gain notoriety domestically and internationally. 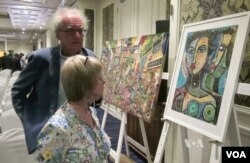 Roughly 300 artists, art lovers and collectors in Nairobi came to mingle Tuesday evening for the third annual Circle Art Agency’s modern and contemporary art auction, which bills itself as the first and only such commercial auction in East Africa. The agency’s director, Danda Jaroljmek, says artwork from Kenya, Tanzania, Uganda, Ethiopia, Sudan, and even Namibia was represented at Tuesday’s auction. Fifty-one paintings and sculptures were on offer, ranging from contemporary portrayals of African wildlife, to traditional village scenes, to works of social commentary, like the one entitled “No African Pope,” or another providing a scathing depiction of a Nairobi doctors’ strike. Dual American-Kenyan citizen Linda Benvenuto has lived in Nairobi since 1975. An art lover, Benvenuto says she remembers when artists concentrated on non-controversial pieces, like traditional African wildlife motifs. “Now, you get more edge, you get more perspective, you feel it a lot more, you feel the sort of grit of Nairobi, the growing Nairobi,” said Benvenuto. In the period after Kenya’s independence, Jaroljmek says artists were beholden to a couple of galleries. Now, she says artists are independent and seek their own opportunities. Benvenuto remembers the first Circle auction in 2013. “It was very exciting, it was a great fever and you can see that people are really looking towards Nairobi as an art scene now," she said. The fever appears to have continued. This year the auction grossed more than $191,000 in sales, continuing a steady increase since that first auction.